As soon as the show came out on Netflix, I breezed through it in a day or two of trimming ears. There was so much drama, I couldn’t possibly get bored. Amberle Elessedil seemed like the perfect option for me to cosplay. Of all of the Aradani crew, who is the most likely to be okay getting turned into a tree? Me, of course! (although I would want it to be a native one!) The costumes seemed like they would be relatively easy to replicate since they seemed more modern than Lord of the Rings costumes. I found a couple of cool options. I decided to look for different, affordable pieces to create a similar, not screen accurate, costume. Amazon had almost everything I needed. I had bought the faux leather pants for my Tauriel costume that I never got around to finishing. 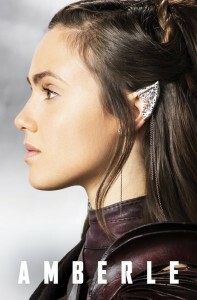 Amberle Elessedil is a main character in The Shannara Chronicles, based on the lead character of the same name in The Elfstones of Shannara. She is a princess and the only child of Aine Elessedil, the oldest son of Eventine Elessedil, King of the Elves. Amberle’s mother died while giving birth to her. She was raised by her father thereafter, becoming very close to him. When Amberle was a child, she would race her friend Lorin to the palace sanctuary where the sentient and magical tree called theEllcrys resided. She beat Lorin to the tree, and when she touched it, she received a vision from the tree for the first time, which was an image of her father’s death. After being kicked out of the sanctuary, Amberle walked with her father, Aine Elessedil to her room. On the way they saw a body on the ground of an unidentified elf and Aine tried to send her away to safety. However, she went to the King’s chambers, where she witnessed the murder of her father by the Gnome assassin Slanter. Due to an idea planted in her mind by her father just before he died, Amberle decided to become the first woman to run the Gauntlet and become a Chosen. By successfully running the Gauntlet, Amberle is the first woman in memory to qualify to be a member of the Chosen, a group of Elves tasked with protecting the sentient and magical tree called theEllcrys. Almost immediately she begins receiving visions of death and destruction from the tree, and she becomes disturbed enough by the Ellcrys to spurn her duty as a Chosen and leave the Elven city of Arborlon. After watching her great-aunt Pyria Elessedil get killed by a Fury and after being saved by Allanon and Wil Ohmsford, Amberle is convinced to return to Arborlon, and she ultimately decides to take on the quest of restoring the dying Ellcrys. Besides Eventine and Pyria, Amberle has two other living relatives, her uncles Arion Elessedil and Ander Elessedil.